The story in this game is very thin but that doesn't really matter as the gameplay is all that matters with this game. Gameplay is that of a simple platformer where you simply have to get to a certain area that has the exit, like that of a 2D version of Super Mario 64 (1996), or a more expansive version of Donkey Kong (1981). Most of the levels use this method but there are points where you will have to fight a giant boss creature. The boss fights will start off a bit difficult but they do have a pattern that you'll catch hold of and that will make the levels easier to get through. This is also one of those games where it is easy to learn but difficult to master, so you are bound to hit a snag (no pun intended) trying to progress though the very tall levels. 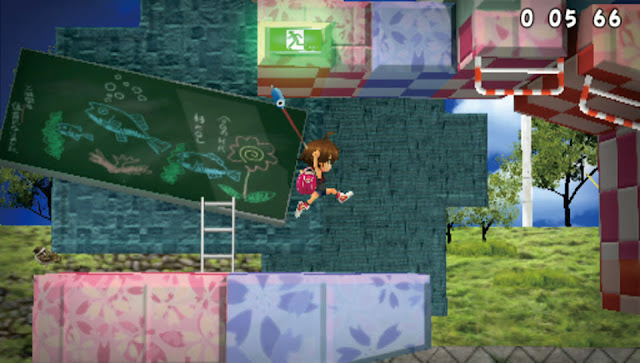 Some levels will have some schoolbags that you can pick up, collecting the schoolbags will unlock stuff like: art, music, and even more characters to play as. The other characters in this game are not just a simple change of the skin, the other characters also have some unique abilities of their own. The abilities include being able to slow down time in order to make precise jumps, and one character has the ability to have an automatic retry for if they get hit or fall to their death. 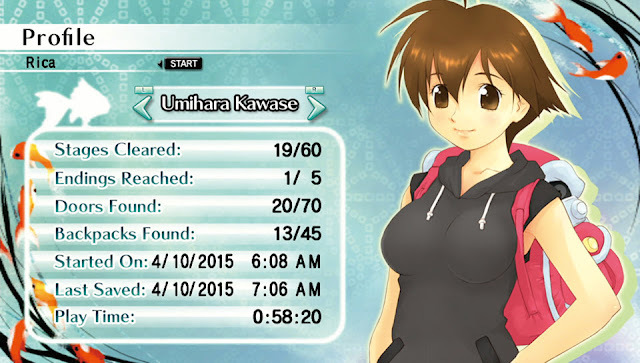 Umihara and her lovely stats. Beating the standard path of levels in this game will not take very long to do as you can beat them in one to two hours. 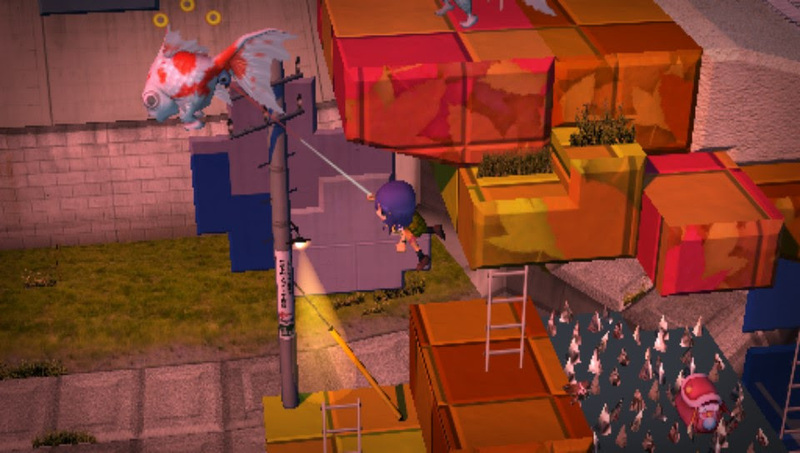 This shortness did make fill me with disappointment until I found out that this game has a load of secret levels that lead to secret endings, this opened the game up to a lot more re-playability. The secret levels will require some skill to get to, but that is half the fun to it as not only will you sharpen your skills, you will be rewarded for doing so by finding those secret doors. Add all of the secret rooms and this game goes from being a one to two hours game to being a game that'll have you playing for hours on end. The controls in this game do take some time getting used to as this game is all about timing your swinging and jumping correctly. The way you launch is by attaching your lure onto a wall or platform, hold up or down on the joystick to stretch or tighten your fishing line, then detach your lure from that wall or platform and just pray that you got the timing just right. You don't have to put in much effort in your timing until you've reached the secret levels as they can get very frustrating to get though. You will see some scary looking enemies while on your journy, although they aren't that bad to deal with, so you can attack them with your rod. Once you've hit an enemy with your rod, it'll stun them and then you'll have to reel them in order to fully defeat them. One thing I really hate about this game is that once you die on a level, you are forced to go back to the level selection screen instead of given a screen that gives you the options to either retry or go back to the level selection screen. This is frustrating as you'll not only have to deal with re-selecting the stage that you are trying to beat, you'll also have to deal with a bunch of loading screens and this will make your experience feel much slower. I had to deal with this way too many times, especially on the secret stages as they are hard as a day old Whopper Burger (great, now I want a Whopper Burger). Yes, as I mentioned earlier in this review, there is a character that gets an automatic retry but you only get one retry, so once she has died twice on a stage, you'll have to go through the same annoying problems again. This game does have an incredibly nice bonus feature included with this game and the bonus is noneother that the original Super Famicom game from 1994. This is a very nice feature as it helps get a classic game that was unavailable outside of Japan for a very long time and help expose it to a new fan base that deserve to play this title. 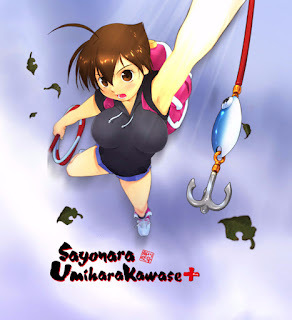 The original game is worth playing as it is very fun to where I enjoyed playing it a lot more than Saynonara Umihara Kawase +, that says a lot as I did enjoy Saynonara Umihara Kawase + a fair amount. Super Ninja Fishing, coming soon to Atari 7800, November 5th 1990. The level designs are very strange and can be hard to get your mind wrapped around them. The layout of the levels are good but not great, they are fun to play and navigate around but there are times where the levels felt a bit too rough around the edges. The levels could've been fine tuned a little bit as it did feel like that these levels were made with an in-game level creator... Actually, a level creator in this game would've been a really nice feature to have. The levels do also build up a weird and trippy atmosphere just like that from Alice in Wonderland (1865), it suited the game very well and you do feel like that you have fallen down the rabbit hole, waiting for someone to fish you out. The graphics in this game are very simple and cute but this game also looks a little dated and looks like a game that was meant for the Playstation 2 or for the Playstation Portable. The character designs are very cute and adorable and will put a smile on your face. 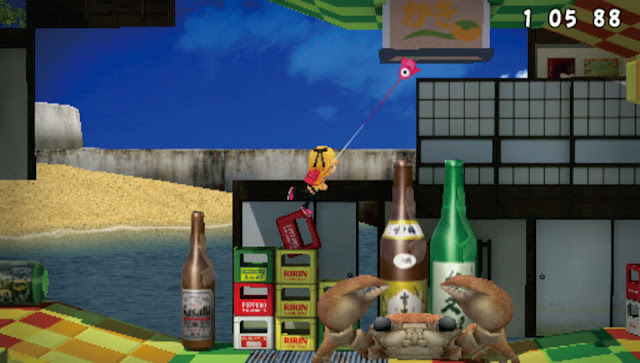 The graphic models for the stages are a bit on the ugly side as while colorful, they did look a little dull to where the platforms look liked that they were made from nothing but random pieces of cardboard. The animation is very lively and charming and adds to the cuteness and effect of the characters. Music in this game is very cute and gives off a very warm vibe and added a weird sense of irony to all of the stages. The music itself also sounded very good and I wouldn't mind owning the soundtrack to this one. Overall, this game has some problems but it ended up being a very decent game that is worth playing. If you don't want to get this for the main game, the addition of the Super Famicom game is enough to make you buy this on its own as it is a great game. Decent game(s). *Note: Rough English translation by me and not by Google Translate... For once.